This is the second and last installment of my “When Life Gives You Bananas” dictums. 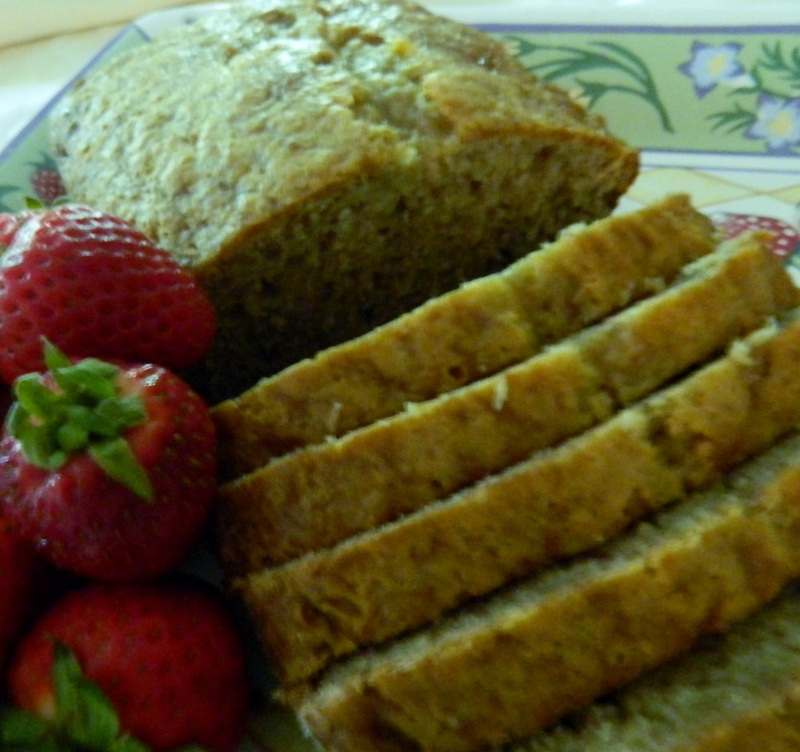 This recipe is for when you have two over-ripe bananas languishing in the fruit bowl. This is my mom’s recipe and today, March 28, is her birthday. Lois “DeDe” Garneau died 12 years ago this month but her recipes live on. Being a woman who didn’t waste words, mom named these cookies “Banana Cookies.” Their simple name defies their depth of taste and comfort. I cooked my first dinner for mom’s birthday when I was 12. The main course was Shrimp Tarragon. I found the recipe in Good Housekeeping and the ingredients were frozen baby shrimp, dried tarragon (exotic back then) and a can of cream-of-something-condensed soup all gooed up and served over white rice. Mom said it was delicious and never had anything like it. My dessert was Red Velvet Cake with cooked frosting. No vegetable and no salad. Here’s to mom. She really knew how to deal with all the bananas life threw her way. And throughout it all, she taught me how to cook while giving me free rein in the kitchen as I spent hours and summer months experimenting. “Just write down what you need on my shopping list,” she would say with encouragement. As my sister says, “All who passed through DeDe’s kitchen left filled with food and love.” That, my friends, is how it should be. Cream shortening and sugar. Add egg, vanilla and bananas and cream until smooth. Sift together flour, salt, soda and cinnamon. 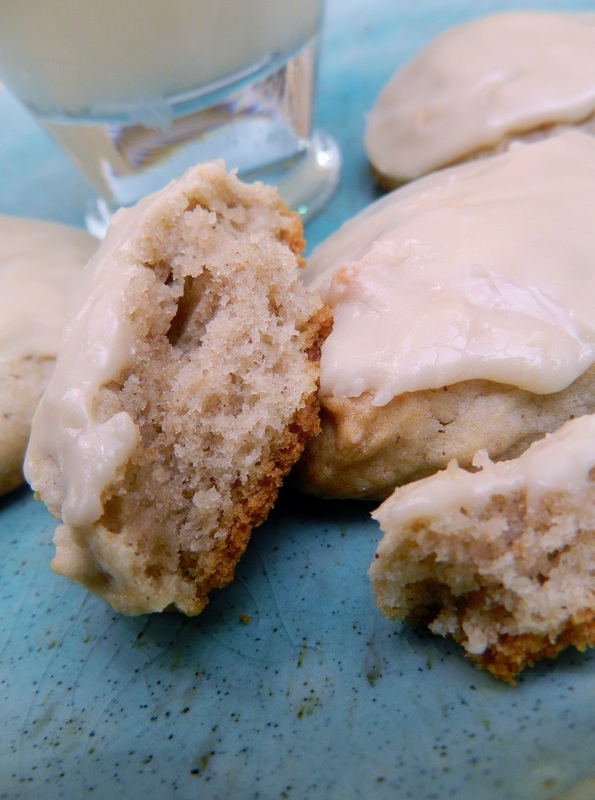 Drop by teaspoon on to cookie sheet. Bake at 350 degrees for about 12 minutes depending on your oven. Frost cookies while they are slightly warm. Husband and son are out for baseball practice getting ready for a double header. Me, I’m home alone with some Magnolia Bakery Vanilla Cupcakes I made, frosting, and a pastry tube. Some say it was the Magnolia Bakery that started the cupcake trend. 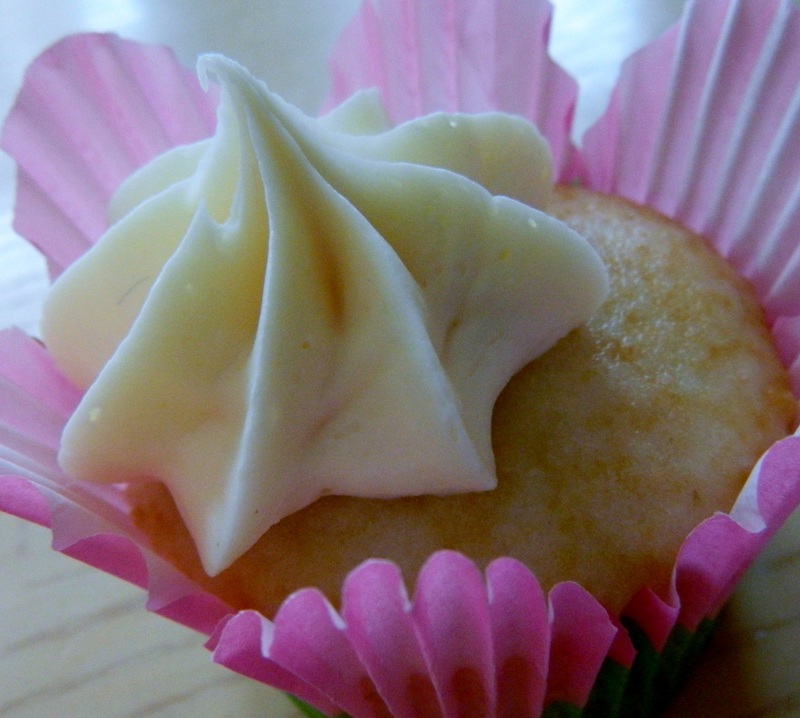 In 2011, cupcakes were named by The Food Channel to be one of the top ten dessert trends. 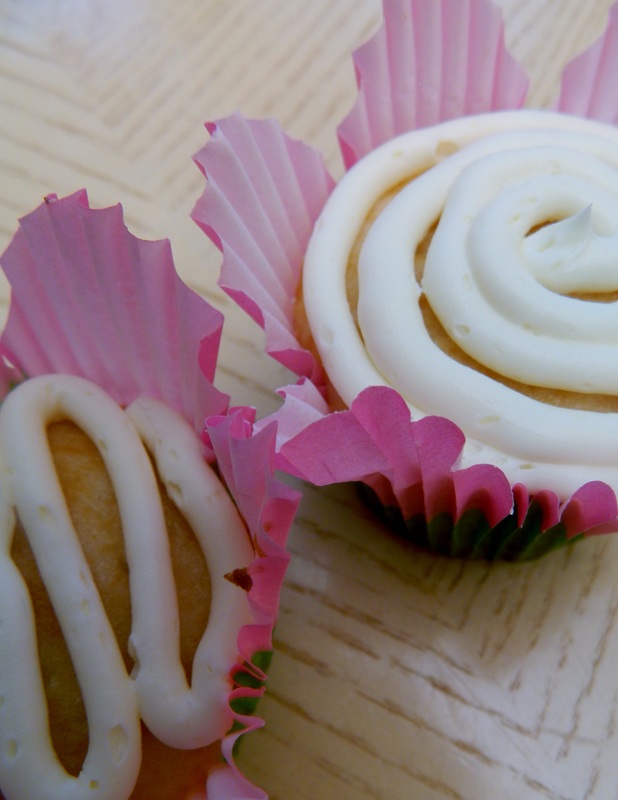 Some reports say cupcakes are on the bubble and that bubble will soon burst. Others say the cupcake trend is going strong and will not die out. I say it doesn’t matter….if cupcakes stop being popular and the long lines to buy them disappear along with the shops, make them yourself. Whether these cute confections are boom or bust, I’ve been making them since age ten and eating them long before that. I have no plans to stop now. And, just a note, Red Velvet Cake, a popular recipe for current trendy cupcakes, has been around a long time too. I’ve been making that since 1971 when my older sister’s boyfriend’s mother gave us the recipe (now that’s a mouthful!). A Google search revealed varied accounts of its history, but it goes way back. In my opinion, the recipe is best left to cakes – the Red Velvet recipe made into cupcakes tends to run dry having such a small space to gather and hold moisture. Easy designs with a simple small round tip. About 25 years ago a friend gave me a pastry tube, professional quality. He knew I liked to bake and made the leap that I should own a pastry tube. I’ve moved that pastry tube six times since then to various cities, apartments and homes. Now, home alone with the cupcakes, I was finally ready to fool around with the pastry tube. 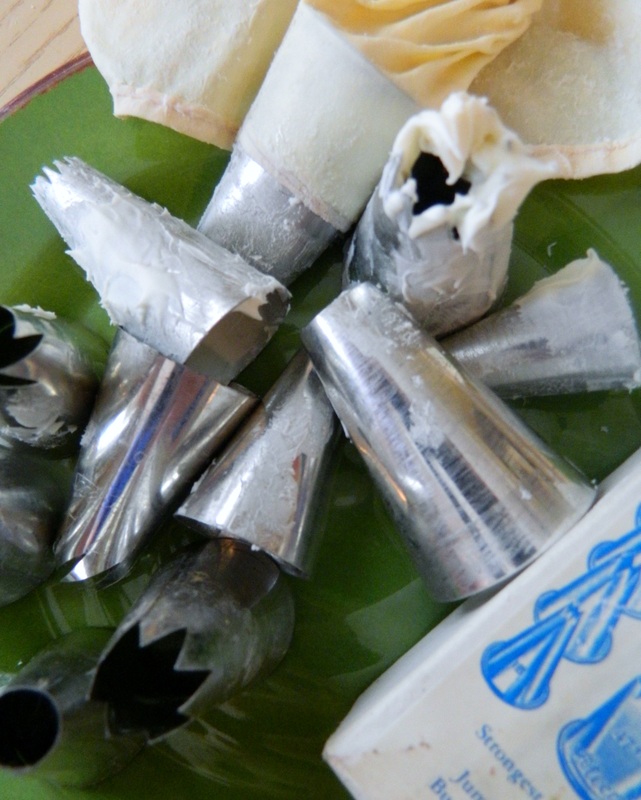 Playing with a pastry tube is a lot of fun but messy when you keep changing the tips like I did. However, I’ve just taken my cupcake decorating to a new level. Get yourself a pastry tube and spiff up anything you make. Don’t just look at those two over-ripe bananas languishing in the bowl, do something with them. And, since life is giving you bananas this particular week, I recommend a quick fix for you and those bananas. 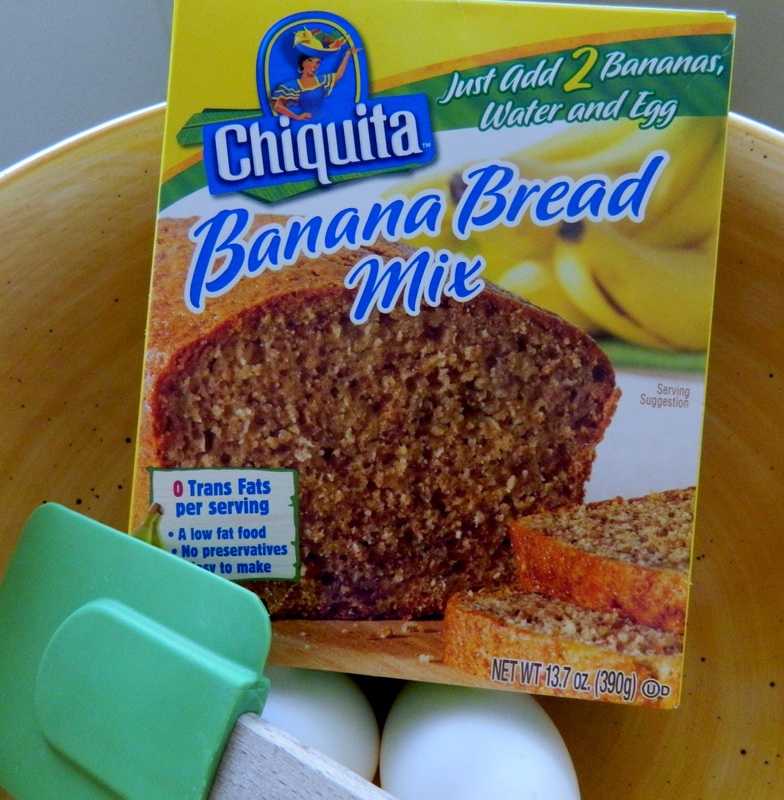 Chiquita makes a top-rate mix found in the produce section of your local grocery store. In my case, it’s Giant Foods. Hint: Look near the bananas. All you need are two bananas, one egg and one-third cup of water. Of course, adding chopped nuts or chocolate chips makes it even better. I wholeheartedly recommend this mix because it is really good – as good as my from-scratch recipe (maybe better). And the ingredients are simple — wheat flour, sugar, soybean oil, and a few other non-chemical ingredients. Lesson learned. Hospitality is from the heart – both in the giving and the receiving. In our home we always have the traditional corned beef and cabbage (for my special recipe with glaze click here). 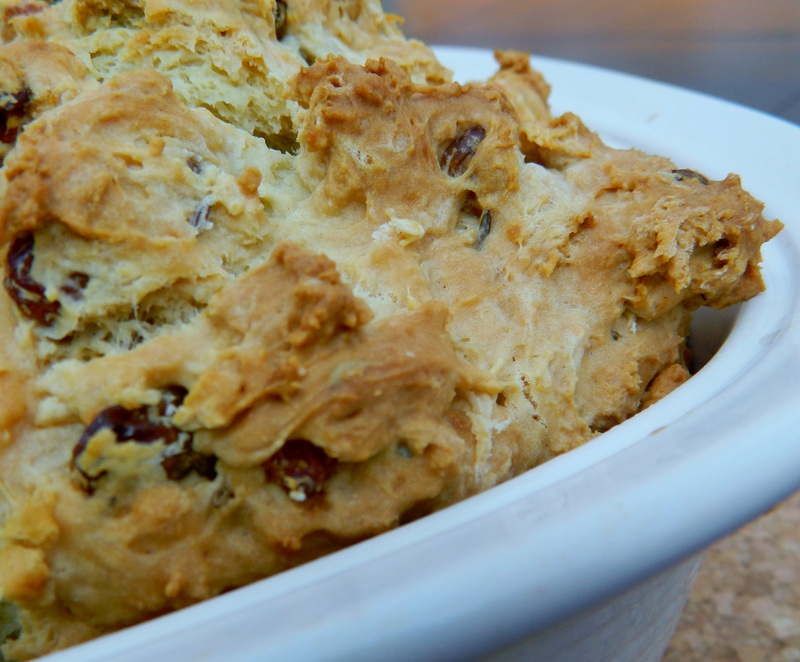 And, of course, Irish Soda Bread. This year, I also made some mini breads. I can’t wait to get busy delivering these little breads to some little leprechauns. Happy St. Patrick’s Day! Bread hot from my oven. Mix flour, sugar, baking powder, baking soda, and salt. Rub shortening into flour mixture. 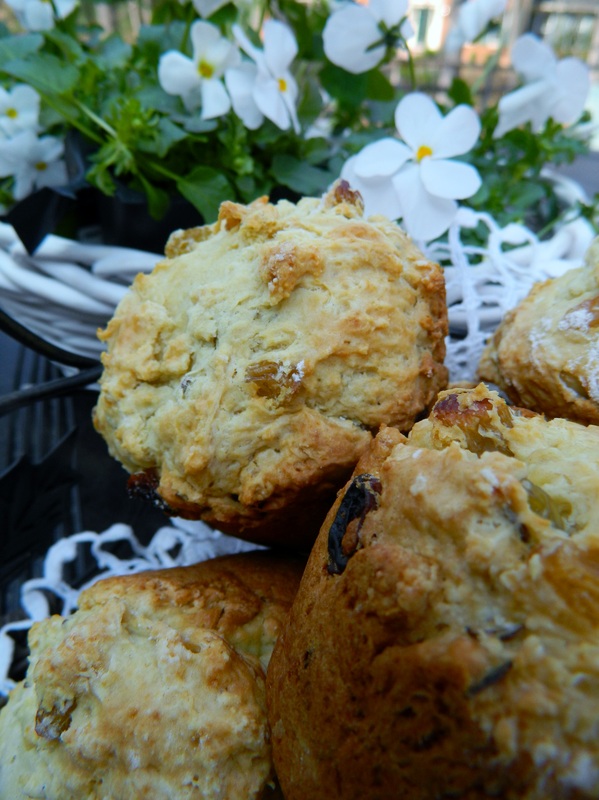 Add well-beaten egg, buttermilk, raisins and caraway seeds and combine. Knead in the bowl; add up to 1/2 cup extra flour if needed. Bake in greased dish with a cross cut in the top of dough. Bake for one hour at 375 degrees. Barbara and the Culinary Composer. Photo by Cindy Dyer. 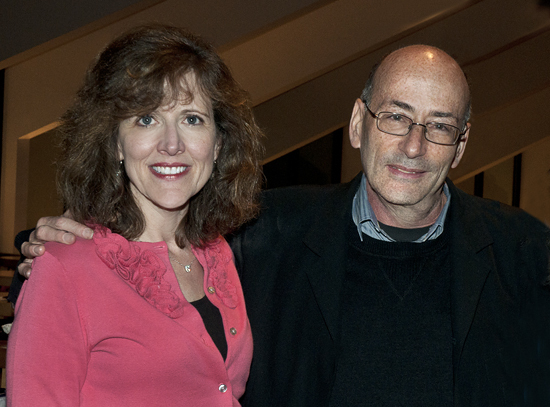 It’s not every day that you get to meet a world-renowned composer. I’m only this lucky because it was my assignment as editor-in-chief of Hearing Loss Magazine. Composer Richard Einhorn’s most notable work, Voices of Light, was performed on March 2 by the Baltimore Symphony Orchestra (BSO), with Marin Alsop, conductor, at the Joseph Meyerhoff Symphony Hall. The Hall was equipped with an audio loop (hearing loop) for the performance so people with hearing aids could get customized sound directly to their ears, enabling them to enjoy the music without background distractions. Thus, the reason for my assignment. Voices of Light, an oratorio scored for soloists, chorus, orchestra and a bell, premiered in 1994 and has been performed around the world. The oratorio was inspired by Carl Theodor Dreyer’s 1928 silent film The Passion of Joan of Arc. I had been listening to Einhorn’s Voices of Light for weeks in preparation for the article and photo shoot. I loved the music and the lyrics which are sung in Latin, Middle French and Italian. Far from being a singer, I found myself crooning Latin as I whipped around in my Jeep Cherokee. You can imagine my anticipation about meeting Richard Einhorn. I picked him up at the airport and had about 20 minutes to chat with him en route to Baltimore. I had butterflies mostly because I was concerned that my poor sense of direction, even with a navigation system in my car, would cause us to be late. We were scheduled for a photo shoot at the Peabody Institute of Music at the Johns Hopkins University in Baltimore and I didn’t want to blow it by getting lost. For the next 20 minutes we talked cooking, recipes, wine, hospitality and all things food! I turned to him and said, “Here I am with a world-renowned composer and we are talking about food!” He laughed and smiled warmly. I appreciated that reaction. If you get a chance to see Voices of Light or listen to the CD, please do. Chalk up March 2, 2012, as one of my favorite days – meeting Richard Einhorn then enjoying the BSO’s performance of Voices of Light. 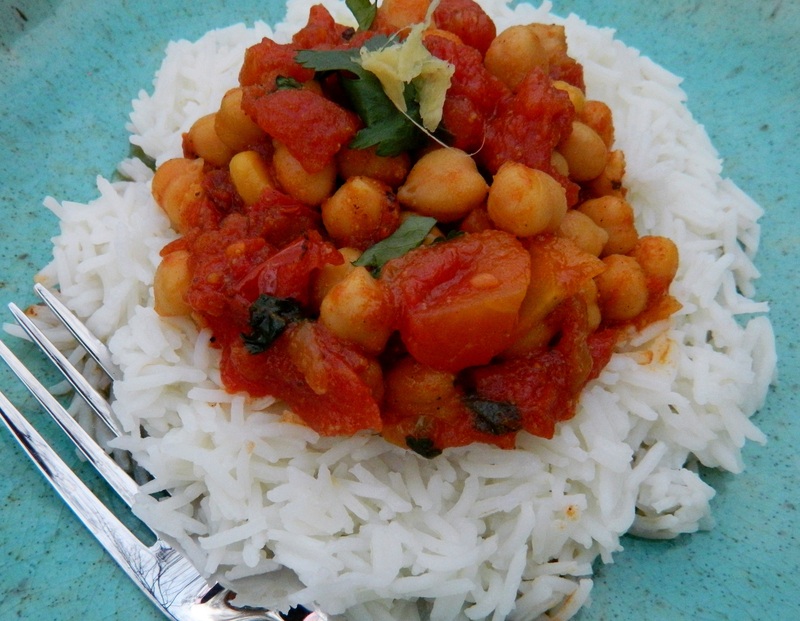 Richard later sent me the recipe for Chana Masala. Now, it has been made in the Washington, D.C., area, albeit, not by the maestro himself, but by me. We had it tonight for dinner for a meatless, Lenten meal. It was fragrant and delicious. I used Muir Glen Fire Roasted Tomatoes, which are my usual brand for anything that calls for canned tomatoes. My friend, Zita, of Indian heritage, pointed me to a “well organized” Indian grocer for the exotic ingredients. You can adjust the spices to your taste. 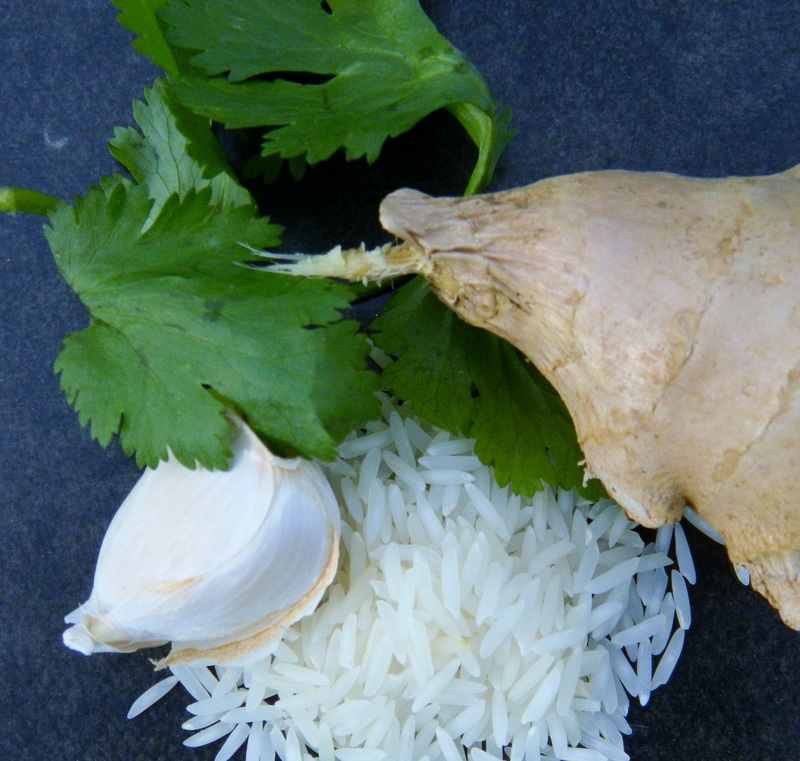 I served it on rice with a garnish of cilantro and ginger slices as suggested. Delish! 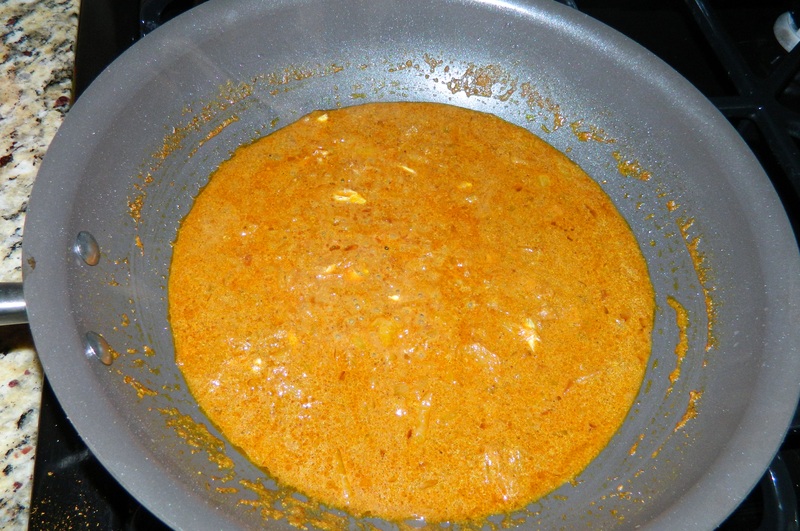 Heat oil in saucepan, about 2 to 3 Tablespoons. Add 1 medium chopped onion and cook over medium heat until caramelized and charred. Lower heat. Add 2 cloves minced garlic, 1 teaspoon cumin seeds, 1/2 teaspoon ground coriander, 1/4 teaspoon ground ginger, 1 teaspoon garam masala, 3 crushed cardamom pods. Cook about 30 seconds, until fragrant. Add 1 cup or less water and scrape pan. Cook until water evaporates. The fragrant sauce before adding the tomatoes. Add 28 oz can tomatoes, including juice. Break them apart. Add 1 teaspoon salt; boil. Reduce heat to low. Add 1 tablespoon cilantro and a pinch of cayenne. Simmer until thickened. Add 2 15 oz cans chickpeas. Stir well. Cook about 5 minutes over low heat. Add 2 tablespoons water. Cook about 5 minutes until water is absorbed. Add lemon juice and garnish with fresh ginger slices.